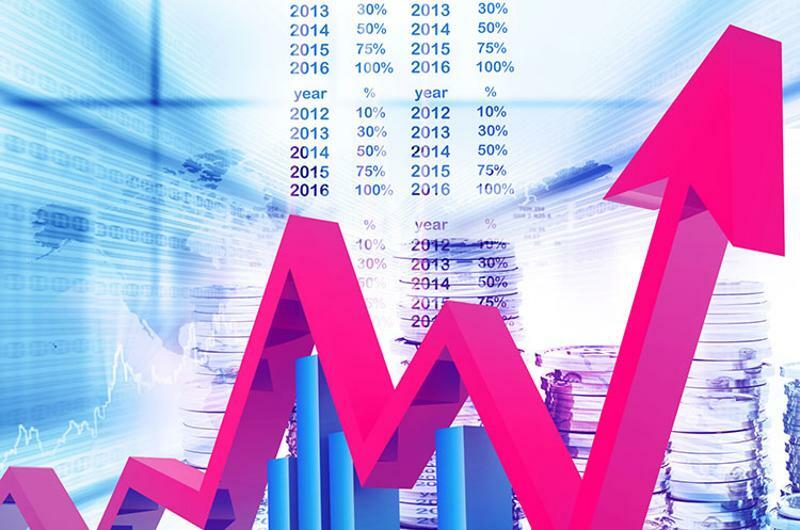 It’s easier for smaller restaurant concepts to achieve high year-over-year growth percentages than it is for larger concepts. Open five restaurants, and, bingo, you’ve grown sales by 50%. So it’s no surprise that when we look at the Top 500 chains with the largest sales increases, we see many regional and even local concepts among the leaders. To paint a broader picture, we took a different tack. We found the fastest-growing chains among the Top 250, parsed by menu category, to get a view of the biggest brands. And then we did the same for the chains ranked 251 to 500—those smaller regional players. For perspective, all of the chains among the Top 250 had 2015 U.S. systemwide sales of $120 million or more; the sales threshold for the 251-to-500 set was $44 million. Read on for the fastest-growing large and small chain in each limited-service and full-service menu category. Following Noodles & Company among those in the Top 250 are Panda Express (whose systemwide sales are up 11.9%) and Pei Wei Asian Diner (0.6%). After WaBa Grill, among the chains ranked 250 to 500 are The Flame Broiler (14.6%) and Leeann Chin (6.6%). The LSR Asian/noodle category grew by 10.3% overall. 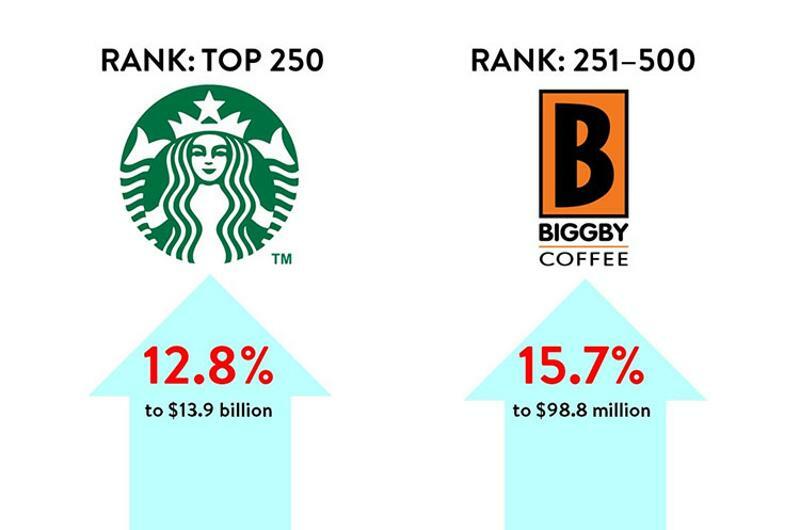 Among fast growers in the Top 250, Dutch Bros. Coffee (which increased systemwide sales by 8.2%) and Dunkin’ Donuts (6.2%) follow Starbucks. After Biggby Coffee follow Scooter’s Coffee & Yogurt (8.7%) and Tully’s Coffee (which declined by 7.4%) among those ranked 250 to 500. The LSR coffee cafe category grew by 9.9% overall. 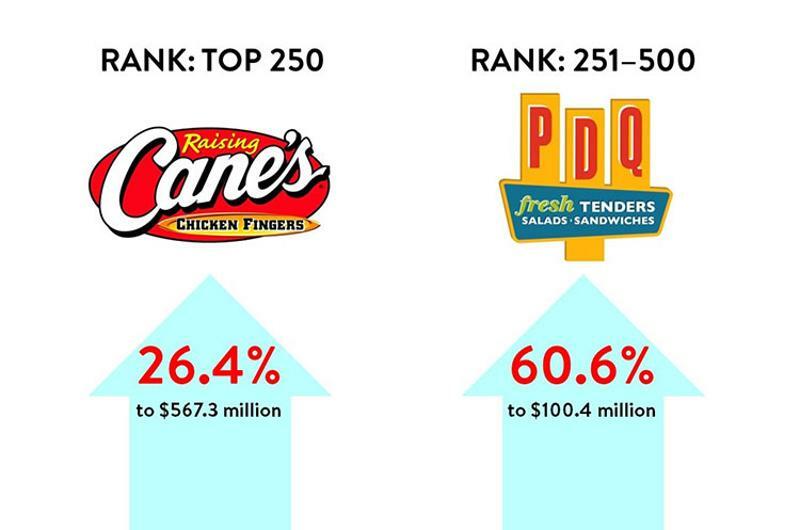 After Raising Cane’s Chicken Fingers among the Top 250 are Pollo Tropical (whose systemwide sales are up 19.3%) and Wingstop (18.4%). Following PDQ among those ranked 250 to 500 are Nando’s Peri-Peri (32.5%) and Chicken Express (4.3%). The LSR chicken category grew by 8.6% overall. 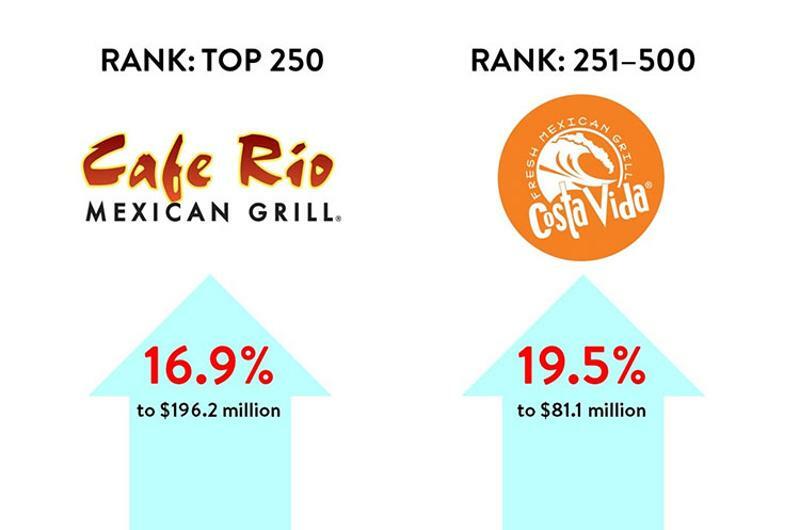 Following Café Rio Mexican Grill among those in the Top 250 are Moe’s Southwest Grill (whose systemwide sales are up 11.7%) and Taco Bell (9.6%). Costa Vida Fresh Mexican Grill leads growth in the 250-to-500 group, followed by Fuzzy’s Taco Shop (14.0%) and Hot Head Burritos (13.5%). The LSR Mexican category grew by 8.5% overall. 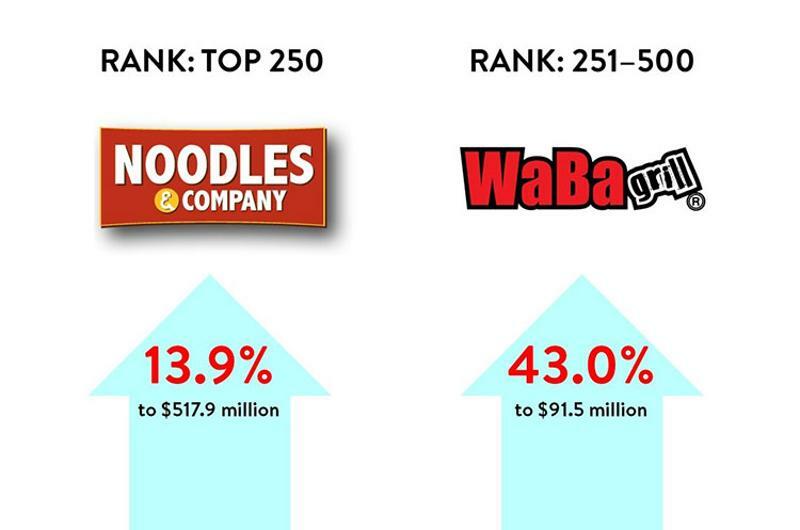 Top grower Zoes Kitchen is followed by Tropical Smoothie Cafe (which increased systemwide sales 26.1%) and Dickey’s Barbecue Pit (21.9%) among those in the Top 250. 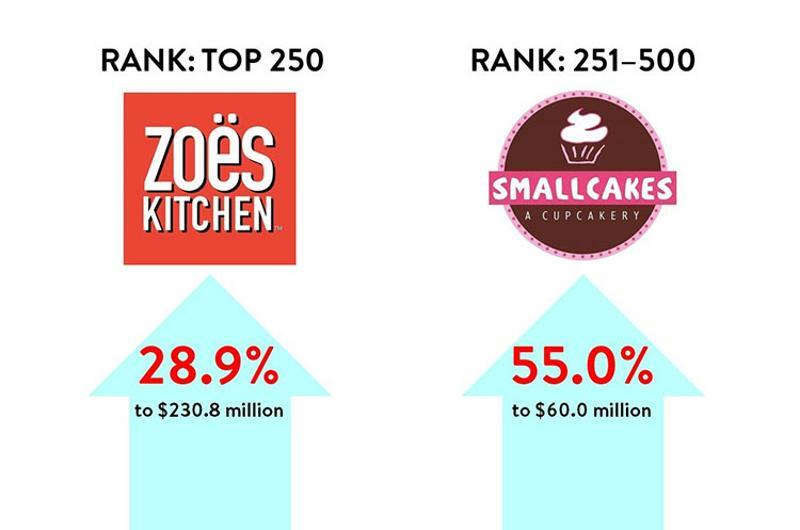 After Smallcakes Cupcakery and Creamery, among those ranked 250 to 500 are Freshii (48.2%) and Sweetgreen (32.7%). The LSR specialty category grew by 7.8% overall. 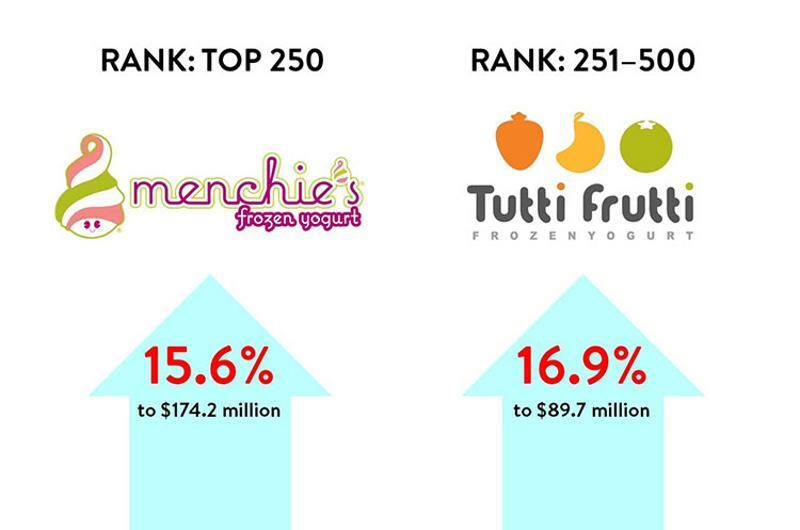 Among the Top 250, Menchie’s Frozen Yogurt is followed by Yogurtland (whose systemwide sales are up 12.5%) and Dairy Queen/Orange Julius (10.1%). Following Tutti Frutti among those ranked 250 to 500 are Bruster’s Real Ice Cream (9.4%) and Marble Slab Creamery (which decreased by 1.4%). The LSR frozen dessert category grew by 6.8% overall. 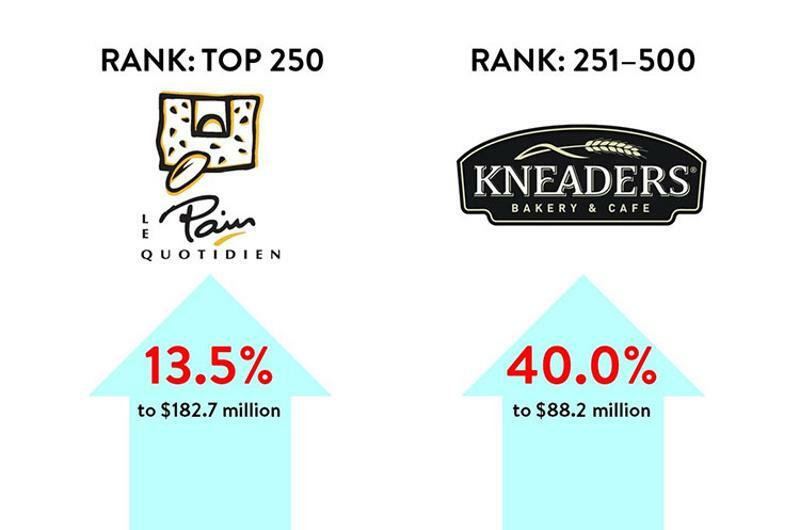 Following Le Pain Quotidien among those in the Top 250 are la Madeleine Country Fresh Cafe (which grew systemwide sales 9.7%) and Corner Bakery Cafe (7.1%). After Kneaders Bakery & Cafe among those ranked 250 to 500 are Boudin Sourdough Bakery & Cafe (14.8%) and Alonti Catering Cafe (10.9%). The LSR bakery-cafe category grew by 6.7% overall. Domino’s (whose systemwide sales are up 14.1%) and Jet’s Pizza (13.4%) follow Marco’s Pizza among leading growers among the Top 250. 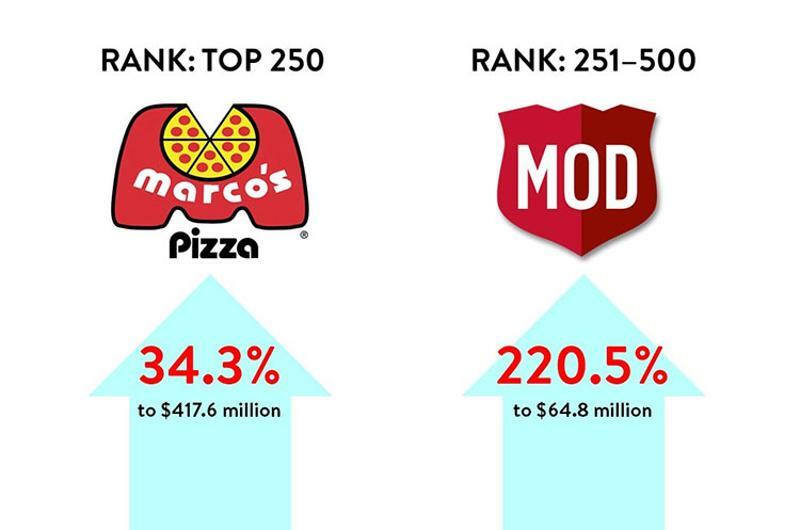 Among those ranked 250 to 500, after MOD Pizza are Blaze Pizza (204.8%) and Pieology (67.3%). The LSR pizza category grew by 5.9% overall. Following Shake Shack among those in the Top 250 are The Habit Burger Grill (which grew systemwide sales 42.5%) and Freddy’s Frozen Custard and Steakburgers (33.1%). 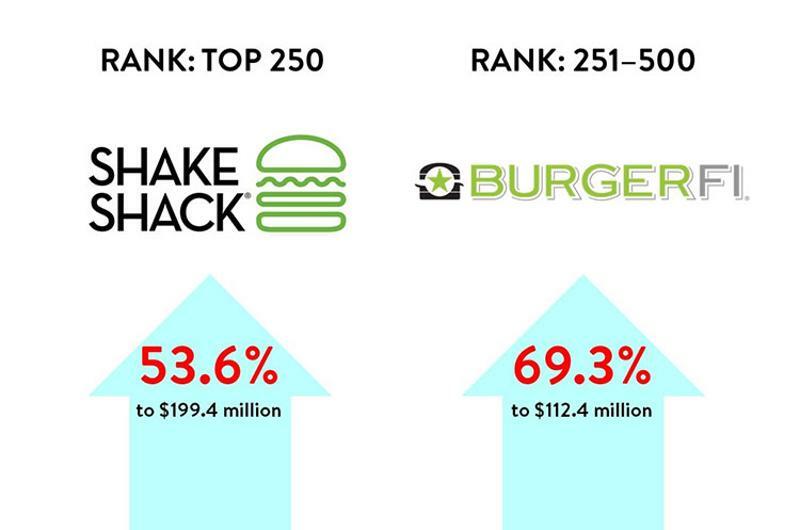 After BurgerFi among those ranked 250 to 500 are Mooyah (31.4%) and Cook-Out Restaurant (18.6%). The LSR burger category grew by 3.3% overall. 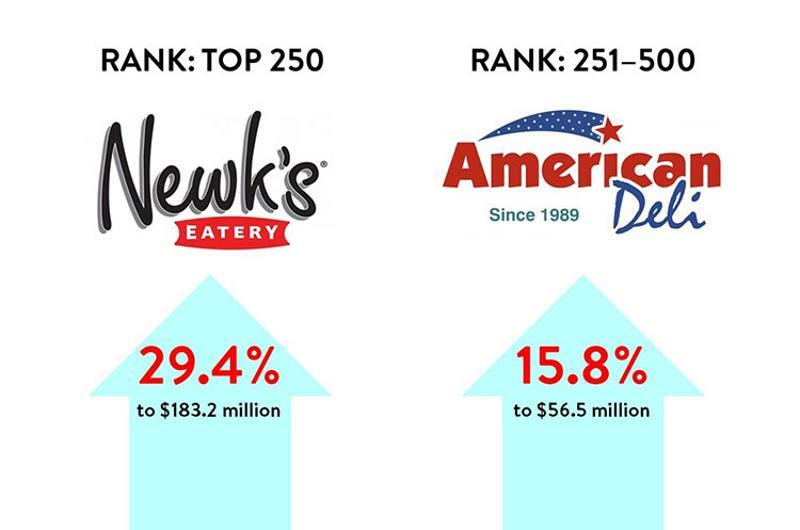 Newk’s Eatery tops those in the Top 250, followed by Jersey Mike’s Subs (whose systemwide sales are up 28.6%) and Charleys Philly Steaks (18.9%). Leading those in the 250-to-500 ranking is American Deli, followed by Runza (11.0%) and Pita Pit (8.1%). The LSR sandwich category grew by 2.7% overall. After Sizzler among those in the Top 250 are Souplantation & Sweet Tomatoes (whose systemwide sales are up 0.7%) and Golden Corral (0.3%). 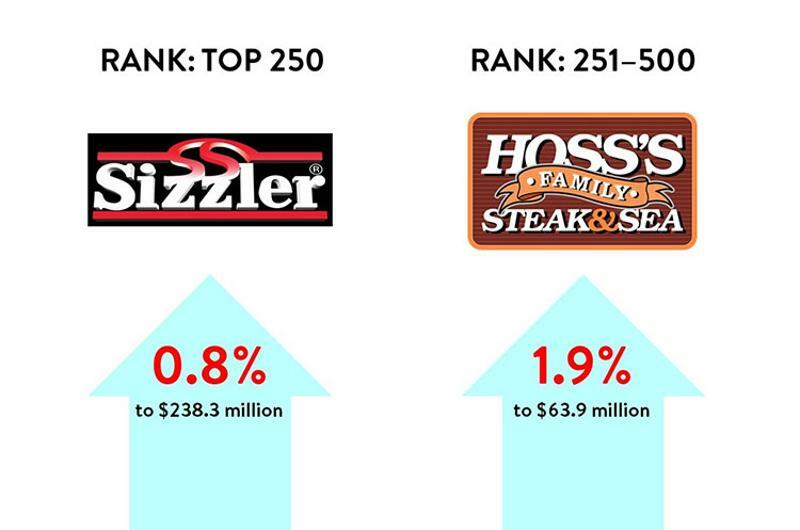 Following Hoss’s Steak & Sea House among those ranked 250 to 500 are K&W Cafeterias (0.3%) and Western Sizzlin (whose systemwide sales decreased 5.1%). The LSR family casual category decreased by 2.9% overall, the only menu category that declined. Following Twin Peaks among the Top 250 are Dave & Buster’s (whose systemwide sales are up 18.3%) and Buffalo Wild Wings (10.5%). 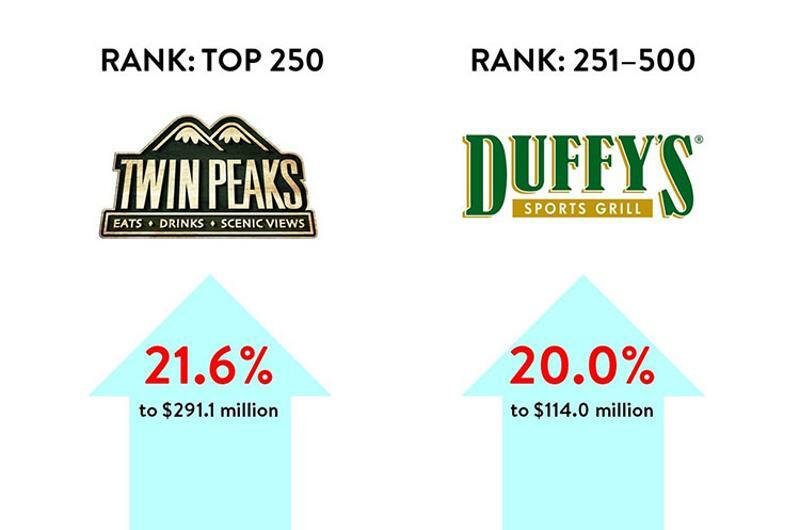 After Duffy’s Sports Grill among those ranked 250 to 500 are 54th Street Restaurant & Drafthouse (16.2%) and East Coast Wings & Grill (15.8%). The FSR sports bar category grew by 8.1% overall. Fogo de Chao (which grew systemwide sales 11.7%) and Texas de Brazil Churrascaria (10.2%) follow Texas Roadhouse among steak chains in the Top 250. 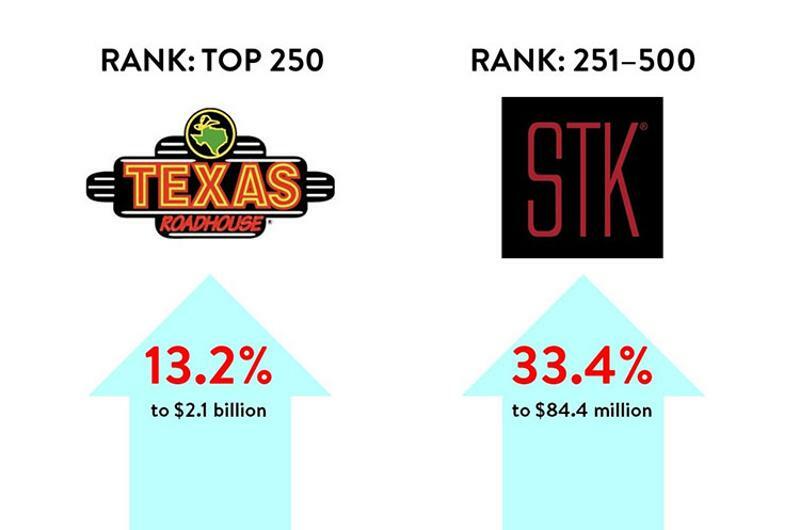 STK leads those ranked 250 to 500; Tucanos Brazilian Grill (22.6%) and Redstone American Grill (16.0%) follow. The FSR steak category grew by 6.0% overall. 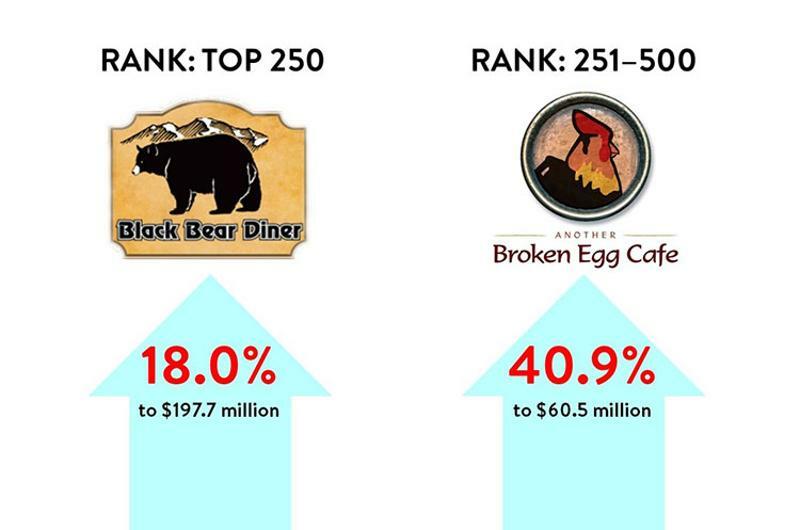 After Black Bear Diner among those in the Top 250 are First Watch (which increased systemwide sales 10.4%) and IHOP (8.1%). Following Another Broken Egg Cafe among those ranked 250 to 500 are The Egg & I Breakfast & Lunch (12.0%) and Country Kitchen (6.0%). The FSR family style category grew by 3.1% overall. 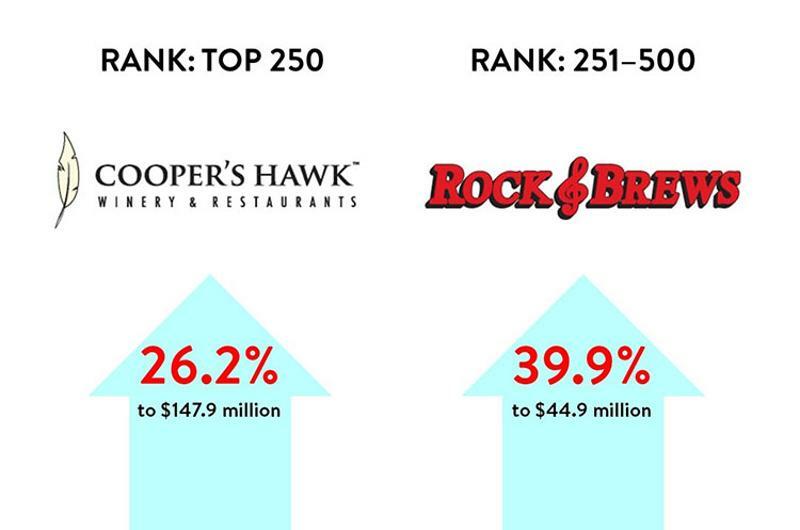 Following Cooper’s Hawk Winery & Restaurants are Kona Grill (whose systemwide sales are up 20.1%) and Firebirds Wood Fired Grill (14.6%) among those in the Top 250. After Rock & Brews are Del Frisco’s Grille (30.2%) and Bareburger (30.1%) among those ranked 250 to 500. The FSR varied menu category grew by 4.1% overall. Genghis Grill (whose systemwide sales are up 1.9%) and P.F. 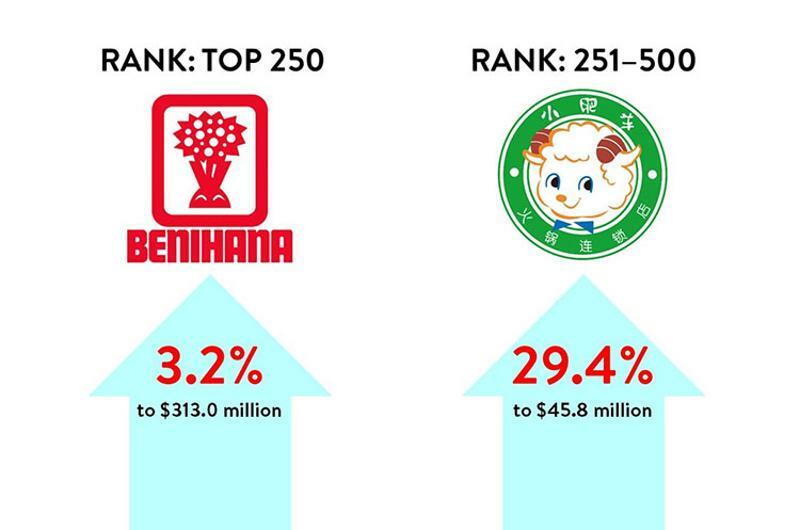 Chang’s China Bistro (1.0%) following Benihana among those in the Top 250. Among those ranked 250 to 500, after Little Sheep Mongolian Hot Pot are Gyu-Kaku (10.1%) and HuHot Mongolian Grill (6.7%). The FSR Asian category grew by 2.5% overall. 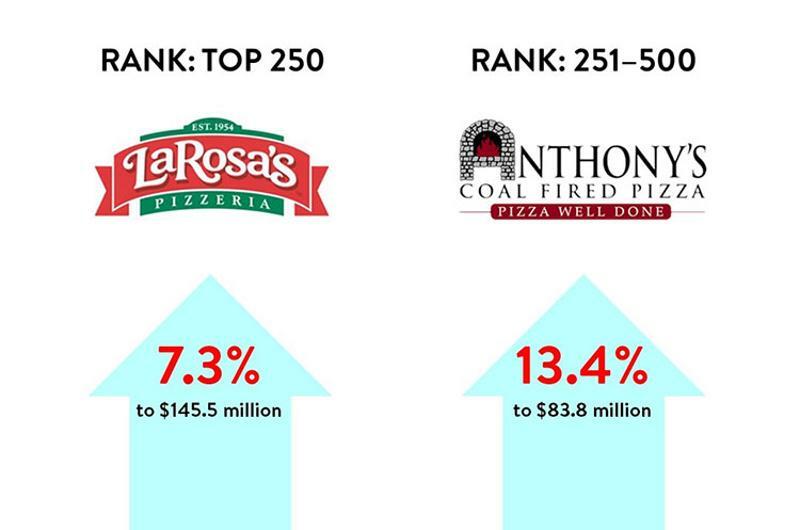 Following LaRosa’s Pizzeria among those in the Top 250 are Bravo Cucina Italiana (which increased systemwide sales 5.8%) and Mellow Mushroom (5.2%). After Anthony’s Coal Fired Pizza among those ranked 250 to 500 are Oregano’s Pizza Bistro (11.4%) and Brixx Wood Fired Pizza (11.2%). The FSR Italian/pizza category grew by 2.5% overall. After Chuy’s among those in the Top 250 are Uncle Julio’s (whose systemwide sales are up 13.6%) and Pappasito’s Cantina (5.9%). 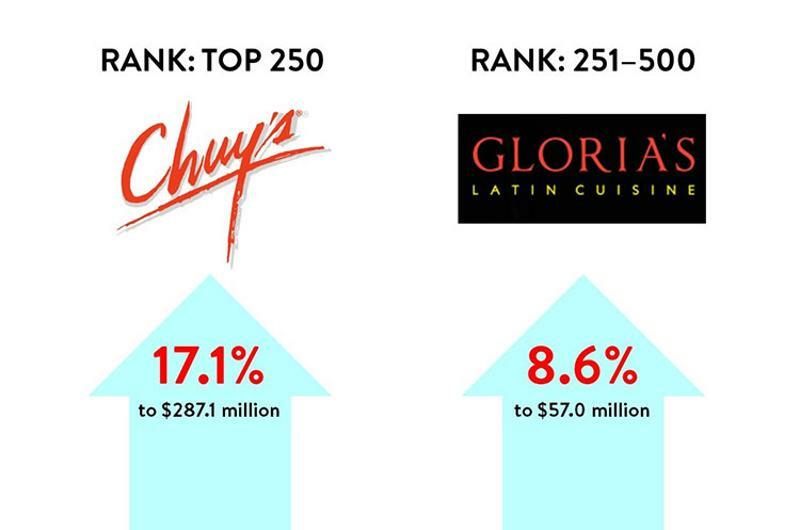 Following Gloria’s Latin Cuisine among those ranked 250 to 500 are Dos Caminos (6.5%) and Rosa Mexicano Restaurants (4.2%). The FSR Mexican category grew by 1.8% overall. 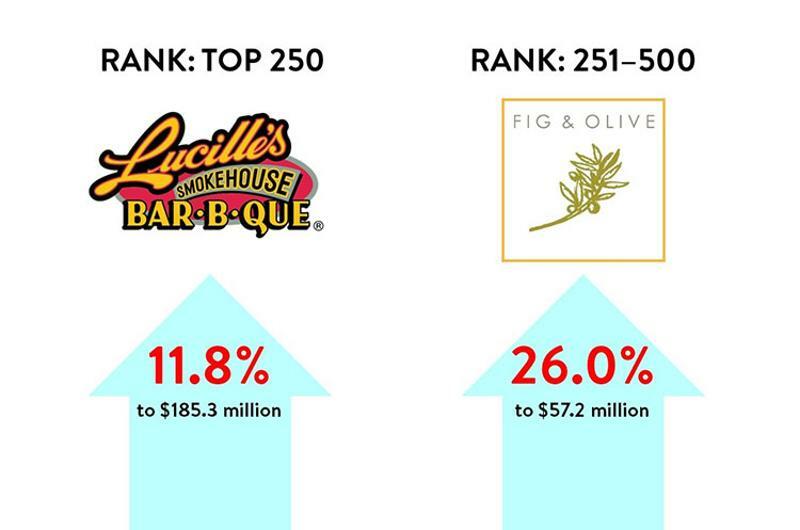 The fastest grower among those in the Top 250 is Lucille’s Smokehouse Bar-B-Que, followed by Smokey Bones Bar & Fire Grill (which increased systemwide sales 2.6%) and Sonny’s BBQ (down 0.1%). Among those ranked 250 to 500, Fig & Olive leads, followed by Barcelona Wine Bar & Restaurant (22.1%) and Hofbrauhaus (20.6%). The FSR specialty category grew by 2.0% overall. Following Legal Sea Foods among those in the Top 250 are Pappadeaux Seafood Kitchen (whose systemwide sales are up 4.0%) and Bonefish Grill (2.1%). 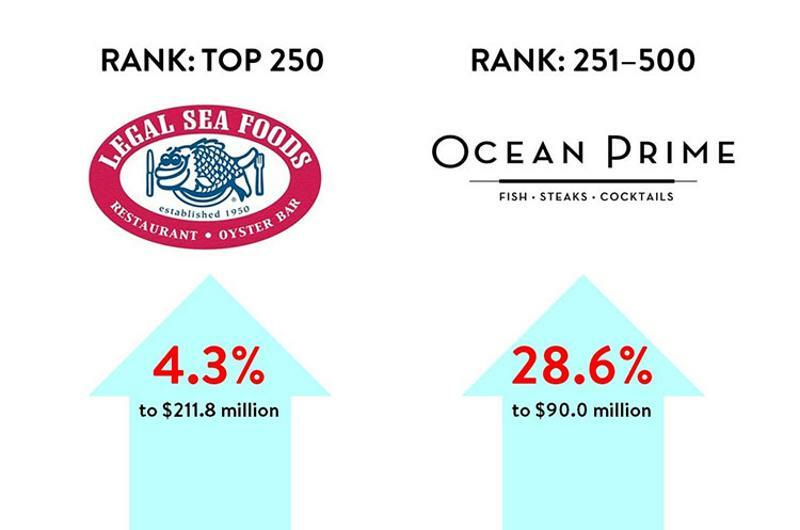 After Ocean Prime among those ranked 250 to 500 are Boiling Crab (17.2%) and Eddie V’s Prime Seafood (12.9%). The FSR seafood category grew by 0.4% overall.